FIRST - We're all about cloth bags - of all types. Whether you need a simple cotton drawstring bag or a custom-sized tote bag, we've got you covered. or use our simple contact form and we'll get right back to you. I use a custom size drawstring bag to package small high-quality tools ... it keeps them safe for shipping and my customers can use them to protect their purchases. Use tie-top bags for high-end wine or spirits. Secure the top with colored wraphia - makes a great presentation plus cushions the bottles. Packaging popcorn in drawstring bags really gives it that farm fresh look. Plus we can print the FDA label and barcodes right on the back of the bag..
"The bags came out great - better than expected ..."
"Bags are great. I've gotten some good response from them so far!" "Thanks for all your help with our project bags - I am SO glad I found you!" "Thank You! We really love the bags, they came out exactly as we hoped. Thank you again." Or you can browse our site to find ideas and comments from our customers. 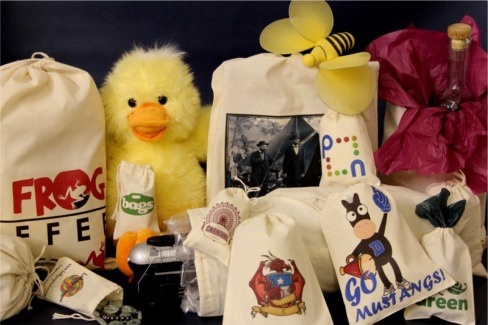 Remember - any of these bags can be custom printed with your design - from 1 to 1000's - all with super-quick turn around times. WHENEVER you see one of these buttons, just click it to see more information about the topic highlighted. Naturally, you can always get right back to the main site when you're finished. "YAY! ... thanks so much for working with me on the quantity. ... I approve the quote and lets move forward with production. Numbers look great!" "The small bags arrived yesterday and look great! I'd like to go ahead and place an order for the larger bag. I love how you were able to enlarged the logo slightly - it makes the bags look perfect!" "I got my bags... everything looks awesome. I love them !" "We picked up the bags ... yesterday and are extremely pleased. Thank you so much they look fantastic. ... Thanks again for a job well done." "Thank you - my life is so much easier for having you and the bags in it! :-) ." Keep samll assembly parts together in a drawstring bag.